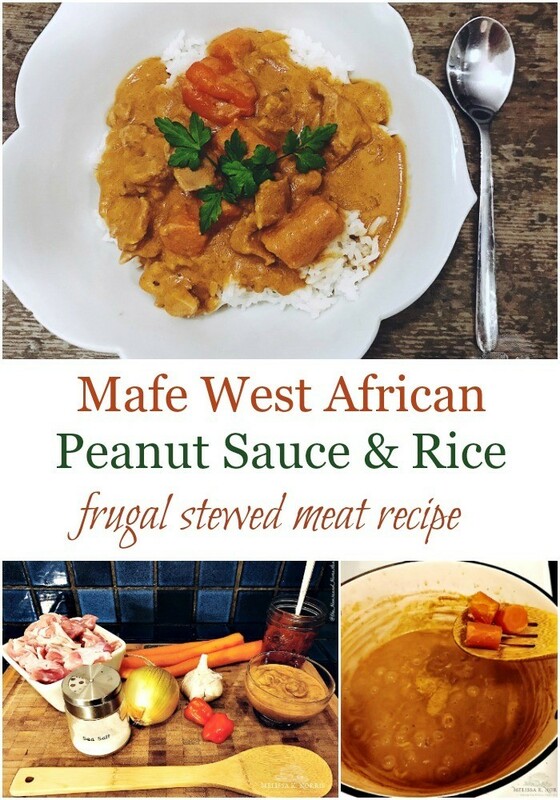 Mafe- a Peanut Sauce & Rice Recipe and how I came to have it. Before I was a homesteader, I was a traveller. In fact – ironically enough – travelling is one of the things that inspired me to start homesteading in the first place. Experiencing how different cultures lived around the world, enjoying all sorts of new and exotic dishes and seeing how people in other countries lived off the land and (in some cases) made do with very little, inspired me to take what I learned and apply it at home. I started cooking from scratch and expanding my repertoire of homemade meals. I took more of an interest in where my food came from and started eating more locally and seasonally. Eventually I even started growing food myself, canning and preserving and even making other products from scratch like soaps, salves, lotions, candles and cleaning products. It was a slippery slope down the rabbit hole, but it’s the most exciting and rewarding trip I’ve ever taken, and I owe much of it to my experiences living and travelling around the world. One of my most influential trips abroad was a live-abroad volunteer experience in Senegal, West Africa. I, along with one other volunteer, were essentially left to fend for ourselves while learning to adapt to a very different model of reality in a rural fishing village on the coast of Senegal. Life here was so different from what we were used to. At times it truly was as if we had fallen down the rabbit hole (and we voiced this to each other out loud on more than one occasion). Daily life was, of course, very different. Not only did we have to adjust to foreign customs, languages, beliefs and cultural traditions, we also had to learn to survive and thrive with none of the modern conveniences we were used to having in the privileged western world. There were daily power outages, access to running water was spotty at best and there definitely was no such thing as processed foods. To be honest, we were living in the lap of luxury compared to many of the locals, but for me, a 21-year-old Canadian college student who had never had to survive for longer than a camping trip cooking over a propane burner and using a bucket and sponge to shower with, it was a trying time and a big adjustment to say the least. One of the biggest changes I had to get used to very quickly was the food. We either ate what the locals were cooking (which wasn’t terribly varied) or had to cook for ourselves from scratch. At the time, I had very little cooking knowledge and was extremely intimidated by the ingredients at the local market, not to mention clueless as to how to turn any of them into a meal. And so, for the first few weeks I practically lived off of bread and butter and powdered bouillon cubes which I would crumble and spread on top for flavour. I’m pretty sure I was sorely lacking in vital nutrients before long. Luckily, the other volunteer I was living with had much more cooking knowledge than I did at the time, and she taught me a lot about how you could throw a bunch of ingredients in a single pot or pan and cook up a tasty dish from scratch without a recipe by using what some may call common sense. But for me, at this time in my life, it was like watching her work magic over an open flame. When we weren’t cooking for ourselves, we were often eating communal meals with the locals or “dining out” at one of the few little for huts in the area. Thieboudienne, a fish and rice meal also known as “the national dish of Senegal,” was on the menu 99% of the time, and while I did eventually get over my dislike of fish and even learned to quite enjoy this dish, I did get very bored of eating the same thing day in and day out for weeks on end. Until one day I was treated to one of Senegal’s other regional dishes: A red-meat and rice dish with veggies and peanut sauce called Mafé (mah-fay). You can read more about my time in Africa and how it inspired my homestead journey here. 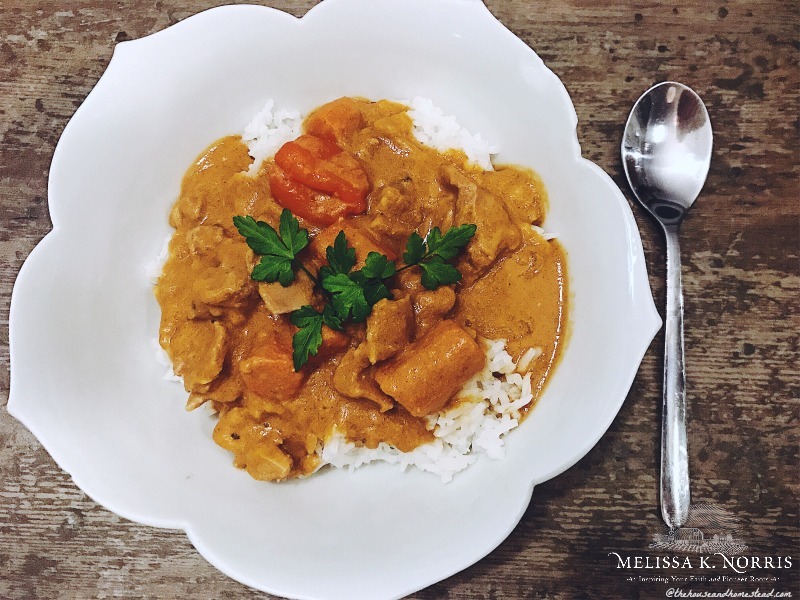 This creamy, meaty, peanuty dish was a welcome reprieve from the tomato-based fish and rice we had been eating for breakfast, lunch and dinner most days, and it quickly became my favourite meal in Senegal. It was all the more sought-after because it wasn’t nearly as widely available as Thieboudienne; Being a fishing village meant there was certainly no shortage of fish, but red meat was a fairly rare treat. Every time I ate Mafé in Senegal, it was made with goat meat, but I’ve since read numerous sources that say it can be and often is made with beef. To be fair, I don’t remember seeing many cows in our neck of the Sub-Saharan, but there were plentiful numbers of goats. But I digress… The point is, you can use either beef or goat meat (or more probably lamb or mutton here in the west). You can even use chicken if you want as I’ve seen Mafé recipes calling for chicken too. But personally I think the rich flavors in this dish work best with red meat. The meat is slow(ish)-cooked in boiling water or broth, to which peanut butter is added and cooked down into a thick, creamy sauce. You can use smooth or crunchy peanut butter depending on preference and availability. Tomato paste and veggies (you can grab how to make and can tomato sauce here) are then added to the stew as it cooks, including finely chopped onion, garlic (I use a mortar and pestle for mine but a food processor works too), whole hot peppers like habaneros for flavour and root vegetables such as carrots, yams and potatoes. You can also add other traditional ingredients like cabbage, eggplant and tomatoes, although I prefer this hearty dish with just meat, starch and a little spice! While your meat, veggies and sauce are cooking, cook your rice. Traditionally this dish is usually made with Broken rice, which is exactly what it sounds like: grains of rice that have been broken during processing and is therefore cheaper as it is not fit for the export market. For this reason, many poor communities in areas of Africa and Asia use Broken rice in their cooking as a frugal but filling staple food item. Once the veggies are cooked (about 15 minutes), remove them from the sauce with a slotted spoon and set aside to stop the cooking process. 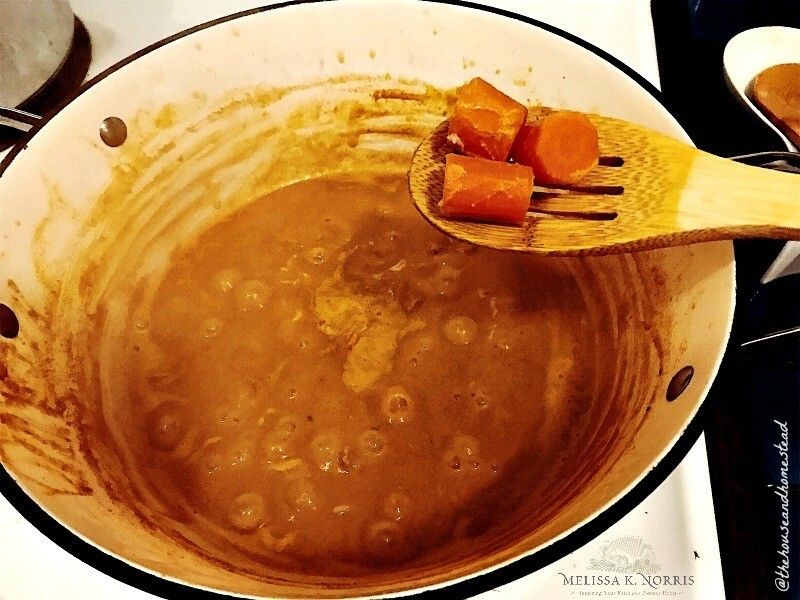 Allow the meat and peanut sauce to continue to cook down and reduce until the sauce reaches the desired thickness (typically only another 5 minutes or so of cooking time once veggies have been removed). Add the veggies back to the sauce and combine well with the meat (I like to puncture the habanero peppers and squeeze in the spicy juices to the sauce, although you can simply remove them or leave them whole (or omit them altogether) if you don’t care for as much heat. Spoon your peanut sauce, meat and veggies overtop of rice (either in individual serving bowls or on one giant, communal platter as is customary in Senegal) and garnish with a little fresh parsley. Serve hot and enjoy a combination of bold and vibrant flavours and textures that could only have evolved from this equally bold and vibrant country in West Africa that holds a very special place in my heart. A bold, hearty, stick-to-your-ribs dish made with beef, lamb or mutton, root veggies and thick peanut sauce spooned generously over rice. 8 cups of water (or broth – chicken or veggie works best) *1 Tablespoon Bouillon for flavour if using water. Not necessary if using stock. Root veggies (such as carrots, potatoes, yams and cassava) * Any or all of the above will do. Rice to serve (Broken rice is traditional, but you can substitute any type of rice. Jasmine or Basmati works nicely). Pour 8 cups of water (or stock) into a large pot and bring to a boil. Add salt to flavour. Add meat, peanut butter and tomato paste (and bouillon if using water instead of stock) and reduce to a slow boil (med-high heat). Chop onion and place in a mortar with the garlic and crush with a pestle until the juices are released and both the onion and garlic are crushed and softened. Add to sauce. 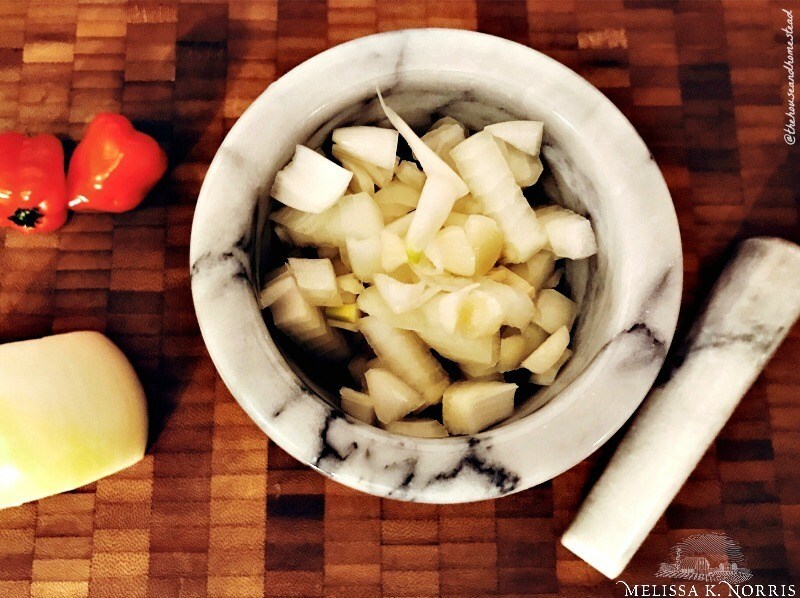 *If you don’t have a mortar and pestle you can use a food processor or simply chop onion finely and crush garlic with a press or chop finely and add to sauce. 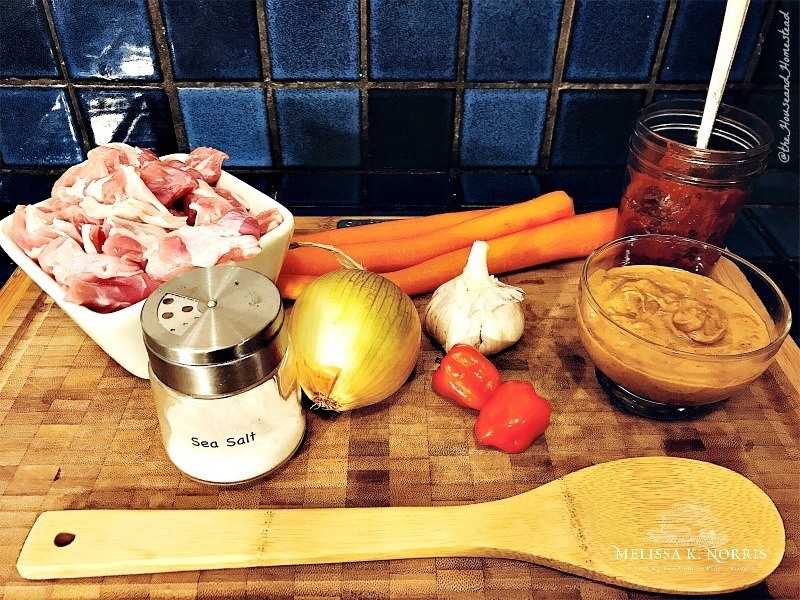 Peel and roughly chop veggies into large chunks and add to the sauce. Add the whole habanero peppers and stir. Allow veggies to cook until tender (about 15 minutes). Cook rice while waiting for sauce to cook. Once veggies are cooked, remove from sauce with a slotted spoon and set aside. Reduce heat to a simmer and continue to cook until sauce is reduced to desired thickness (about another 5 minutes or so). Turn heat off, add veggies back to sauce and mix well to combine. To serve, spoon sauce, meat and veggies over rice and garnish with fresh parsley.